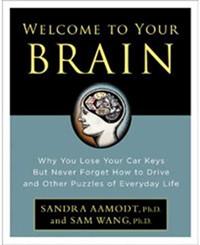 Welcome To Your Brain: "Don't think this is some dreary textbook"
"Don't think this is some dreary textbook"
Aamodt and Wang are both neuroscientists, so they know what they’re talking about, but don’t think this is some dreary textbook. The authors go to great lengths to make Welcome to Your Brain easy-to-understand and fun to read. Instead of getting into the details of the review, let's compare her review with that of Steven Hyman, provost of Harvard Medical School. I never thought we'd get reviews from two such different sources in the space of a month, very cool. They both liked the myth-busting, as well as the treatment of autism. Keerthana liked many parts, and pointed out that the child and teen development parts might appeal to parents (a key demographic that she might be closer to than Steve Hyman). She found the "wacky" illustrations to be quite funny - but Hyman wanted more diagrams showing actual brain regions. They did share one reservation: they both wanted a reference list for further reading. We didn't originally include one, which just goes to show how un-textbooky the book is. Well, Provost Hyman and Ms. Krosuri, we heard your call. The paperback will have a full reference list! You can also download it here. The paperback also has other new material, for which you'll need to consult a fine bookseller near you in late December.